Here was a real challenging Mystery Foto for the holiday weekend. Identify the Vanderbilt Cup Race and the date of the photo. Provide a rationale. This photo was taken at the end of the 1905 Vanderbilt Cup Race on October 14, 1905. The photo can be identified by the the grandstand in the background and the flag decorations.. The front passenger was William K. Vanderbilt Jr.'s sister Consuelo Vanderbilt Spencer-Churchill, the Duchess of Marlborough. It is possible the gentleman in the rear is either A.R. Pardington or Jacques Balsan (who Consuelo would eventually marry in 1921. 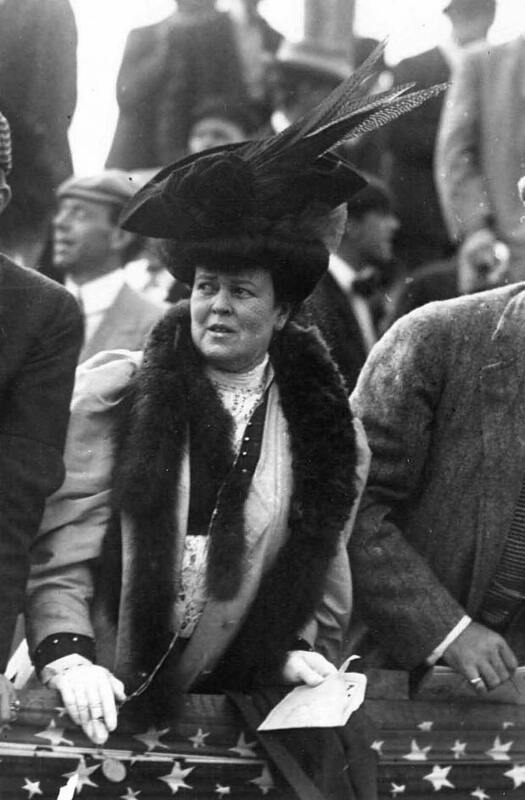 Alva Vanderbilt, Willie K's mother, can be seen in the grandstand wearing a feathered hat. 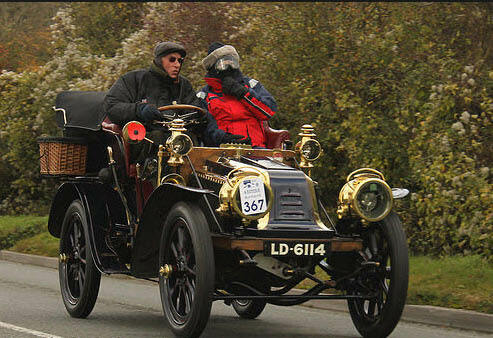 Congrats to Greg O. and Ariejan Bos for identifying the 1905 Vanderbilt Cup Race and the 1903 Renault 14 HP Tonneau. Kudos to Ariejan Bos for identifying both Consuelo and Alva. 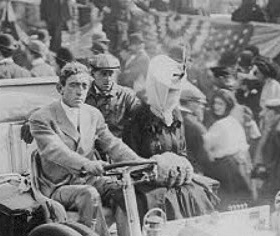 William K. Vanderbilt Jr.'s sister Consuelo Vanderbilt Spencer-Churchill, the Duchess of Marlborough, is under the veil in the front seat. Consuelo (second woman fron the left) as seen in the 1905 grandstand. 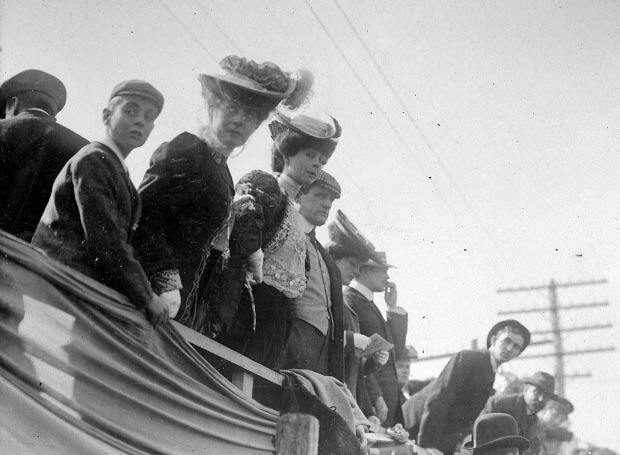 Alva Vanderbilt in the front row wearing a feathered hat. Guessing that’s a mountain range in the back ( but possibly a damaged photograph), its the 1914 VCR in Santa Monica, CA, Feb 27 1914. That could be Spencer Wishart (finished 13th) with the Mrs., arriving at the race. 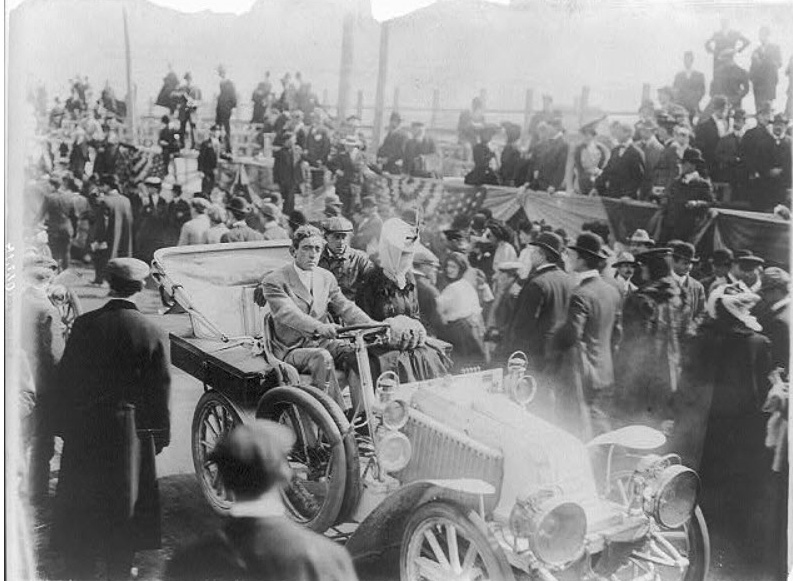 The photo shows Consuelo Vanderbilt leaving Westbury on October 14th, 1905 after having watched the second Vanderbilt Cup race. In the car would be also Jacques Balsan, with whom she would eventually marry in 1921, after her divorce from the Duke of Marlborough in 1920. Photos of Balsan from this period seem to be scarce (I could only find a 1909 portrait photo). Comparing with this photo it seems that he was the passenger in the back seat of the tonneau (which is a 1903 Renault, most probably a 14 HP model). 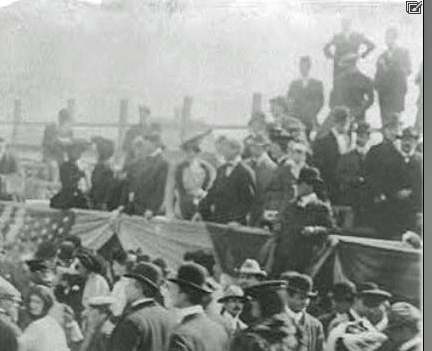 Consuelo’s mother, Alva Vanderbilt-Belmont can be seen standing on the grandstand, exactly above Consuelo, with the hat with pheasant feathers. -Identify the Vanderbilt Cup Race and the date of the photo. Provide a rationale. -Where was this photo taken?